Malaria's Achilles' heel revealed? ~ Health Matters Today! 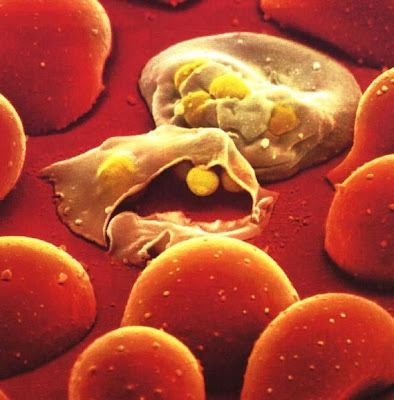 Researchers have today revealed a key discovery in understanding how the most deadly species of malaria parasite, Plasmodium falciparum, invades human red blood cells. Using a technique developed at the Wellcome Trust Sanger Institute, they have found that the parasite relies on a single receptor on the red blood cell's surface to invade, offering an exciting new focus for vaccine development. Malaria kills approximately one million people every year, mostly children under the age of five in sub-Saharan Africa. Currently no licensed vaccine is available. The blood stage of Plasmodium's lifecycle begins when the parasite invades human red blood cells, and it is this stage that is responsible for the symptoms and mortality associated with malaria. Researchers have tried for many years to develop a vaccine to prevent the parasite gaining entry into our red blood cells, but so far they have been unsuccessful. One of the challenges is that the parasite is adaptable – although several red blood cell receptors had been previously identified, none were shown to be essential: when entry through one receptor is prevented, the parasite is able to switch to another. This new research has found a single receptor that is absolutely required by the parasite to invade. "Our findings were unexpected and have completely changed the way in which we view the invasion process," says Dr Gavin Wright, senior co-author from the Wellcome Trust Sanger Institute. "Our research seems to have revealed an Achilles' heel in the way the parasite invades our red blood cells. It is rewarding to see how our techniques can be used to answer important biological problems and lay the foundations for new therapies." The interaction between the parasite protein and the host receptor was discovered using a technique called AVEXIS (Avidity-based Extracellular Interaction Screen). This technology, created by Dr Gavin Wright's team at the Sanger Institute, was specifically designed to detect extracellular receptor-ligand interactions of this type. As well as identifying the interaction, the researchers demonstrated that disrupting this interaction completely blocked the parasite from gaining entry into the red blood cell. Importantly, this was true across all parasite strains tested, making it appear that the receptor is a universal entry pathway. It is hoped that the parasite's dependency on this one protein can now be exploited to develop new and effective vaccines. "By identifying a single receptor that appears to be essential for parasites to invade human red blood cells, we have also identified an obvious and very exciting focus for vaccine development," says Dr Julian Rayner, senior co-author from the Sanger Institute. "The hope is that this work will lead towards an effective vaccine based around the parasite protein." Vaccinating against malaria will be the most cost-effective and simplest way to protect populations against the disease. However, for such an approach to work at the population scale, the vaccine needs to be highly effective so that the vast majority of those vaccinated are immune to the disease. This new research identifies an exciting candidate for such a vaccine. "Recent reports of some positive results from ongoing malaria vaccine trials in Africa are encouraging, but in the future more effective vaccines will be needed if malaria is ever to be eradicated," says Professor Adrian Hill, Wellcome Trust Senior Investigator at the Jenner Institute, Oxford. "The discovery of a single receptor that can be targeted to stop the parasite infecting red blood cells offers the hope of a far more effective solution."